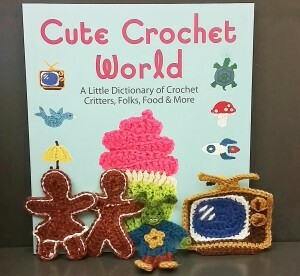 For a chance to win one of three copies of Cute Crochet World and a sweet motif from the book, leave a comment at Lark Crafts blog: http://www.larkcrafts.com/needlearts/cute-crochet-world-giveaway/ Don't wait too long--the deadline for leaving a comment is Friday, July 11, 2014. The motifs to be given away are the Vintage Television, Gingerbread People, and a Martian Costumed Kid. P. S. The Gingerbread People are turned wrong-side-up in this photo--they're really much nicer-looking! That is really cute. I have not seen that book before. Love the motif's to be given.